Click on any of the guide options below to help you make the most out of your photography session. When should we take photos? What are your packages & pricing? Do you have any tips & Tricks? 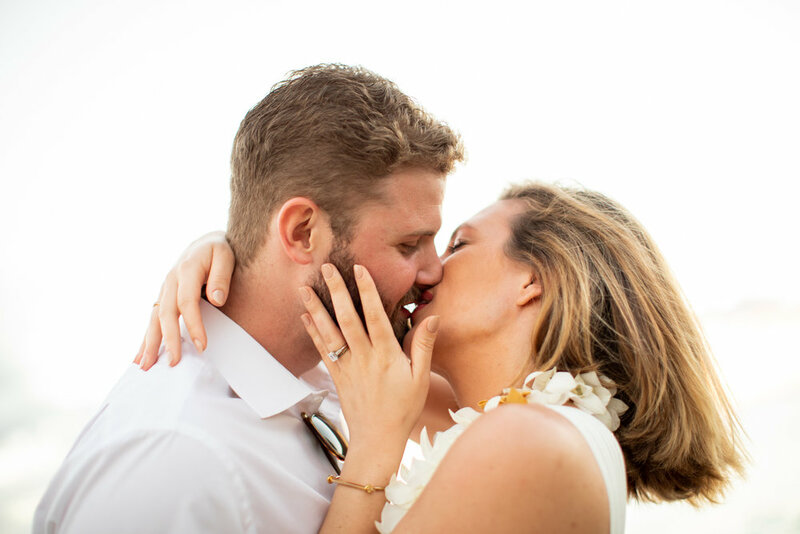 Get your photos done before you get sunburned by the strong Hawaii sun! If you choose to do an in-person design consultation to customize your photos and wall-art, we will need time to prepare your images for your viewing. We will have more time to reschedule if it is raining on the day of your session. If you have very young children under 5 and are coming from the continental US or Canada, this may be a better option for them as sunset is quite late at night with the time change, and you may find your little ones are quite cranky later in the evening! This is our most popular option for soft light and is often accompanied by colorful sunsets. Time zone wise, this is also a great option if you are coming from Asia and morning time is very early for you. • It's always a good idea to bring a small bag with anything you might need for a touchup, or a small toy for your toddlers, but please try to keep it to one bag for your entire group. Often our favorite photos are the ones captured between posed moments, so it's important your hands are free as much as possible for the duration of your shoot. Please leave big bags and unnecessary items in your room! • Build up to the session to children as it really is- a time for fun and togetherness. There’s no need for bribes when the event itself is the reward. Favorite toys, songs, snuggles, and tickling are perfect ways to capture authentic joy from little ones. • We do recommend bringing a very small favorite toy for young children aged 3 and under. For young children, looking at a camera doesn’t make a lot of sense, but if you give us something we can hold over the lens that will capture their attention, it is often much easier to capture a few frames where everyone is looking at the camera. • We work quickly capturing natural images so photography doesn’t feel like a chore to even the most cynical toddler. It’s our pride to deliver a super, safe setting for families to have fun! • It’s always a good idea to bring a snack such as crackers to keep small kids happy. Please keep sugary treats a surprise for when the session is complete. Weather forecasts can be unpredictable during your trip to Hawaii. We always use this NOAA forecast for Kapolei. If it is looking particularly stormy, we will check in a day or two before your session, but in general a good rule of thumb we've found is that unless the chance of rain is over 50%, it is unlikely we will be rained out of our session at the Four Seasons Oahu at Ko Olina. Outdoor shoots offer the best available light and beautiful Hawaii backdrops for your precious portraits. Often, a rainy forecast in Hawaii can mean nothing more than a few passing showers that last five minutes and leave stunning rainbows and colorful clouds in their wake. But if Mother Nature rains on our parade, don’t worry, there are always options: Plan A: When it’s obvious the dire weather forecast is right, we’ll call and reschedule at no charge to you. Plan B: If you don't have time to reschedule we have alternate indoor locations available throughout the beautiful Four Seasons Oahu Plan C: Adventurous? Umbrellas and blankets always add a fun and unique component to photos! An alternative to matching everybody is to choose different shades of the same color. Adding a pop of color through accessories also helps each individual stand out uniquely. Flowy, floral patterns are the perfect item to build your color scheme from and are also comfortable enough to be playful in. Pastel colors are a timeless choice for your family wardrobe. The best way to add contrast to your photos is to choose a pattern for one family member and pull the colors from there to the remaining members. Already here at the resort and need to go shopping for an outfit? Ask us to help you set up an appointment with one of the personal stylists who can walk you through selecting the perfect outfit at the in-house boutique stores. Decide before the shoot what look you're going for. Where in your home will your portraits be displayed? If in a more formal room, be sure everyone's clothing is coordinated to this look. If the room is less formal and more "family" keep this in mind as well. When coordinating colors for a family, we recommend starting with whoever has the hardest time finding the perfect outfit they love. Find something you love and feel great in, and then pull colors from that to put together a complimentary color scheme for the rest of your family. We've included a few sample color schemes below, but ultimately, this shoot is about YOU and making you feel beautiful. Wear something you love and feel good in, and your confidence will shine through in your photos. You can also check out our Pinterest board for inspiration. If you are dressing up in heels for dinner after your shoot, but are hoping to go down to the beach we strongly recommend bringing a pair of flat shoes or flip flops so you can comfortably walk over the rocky path to the beach. Adding accessories is an easy way to add a pop to your photos. While planning the base of your outfit around neutral tones of solid colors, adding accessories will take your outfit to the next level with a scarf, bowtie, bangles, or jewelry. Big logos across a t-shirt can be a major eyesore. Try to steer clear of sports, large words, or brand logos or sayings across the front of your shirt. This takes the attention away from everyone's smiling faces and draws the eye right to the t-shirt. We cannot order your Hakus for you, but if you are unable to get ahold of them directly, we are happy to assist you in connecting with them!